On October 26, Coke released yet another version of its expanding "plus" line of no calorie beverages. Though I've only reviewed the green tea version, I have tried the version with Vitamin C, and I wasn't a fan. That being said, I wasn't offended by it. I just am not a huge fan of the lemon with Coke flavor that is in it. If you live in Japan, you might realize that the Coke Plus line of drinks is a way of more directly competing with Pepsi Nex. First, there was Coke light with 50% of the calories of regular Coke. Pepsi introduced zero calorie Diet Pepsi so Coke finally came out with zero calorie Diet Coke (Coke light is part of history now). Now, they sell Coke Zero. Then Pepsi came out with a diet lemon-flavored version called Pepsi Nex and Coke countered with this stuff. It's interesting that Coke is constantly playing catch-up with Pepsi in Japan when it's the reverse in the U.S. Though I didn't care for the lemon Diet Coke that is Coke Plus, the fact that this has fiber hooked me in. I paid 147 yen for this at 7-11 because I imagined I'd pour this into a glass and see little bits of grain floating around in it. Of course, that's not the way it is. It's more like Metamucil has been dissolved in it, I'd guess. 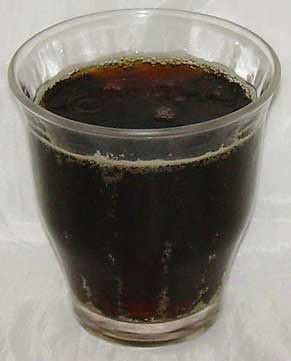 It looks like normal Coke, has the mouth feel of, and smells like Coke with a twist of artificial lemon. This isn't awful, but the difference between this, Coke Plus with Vitamin C and even Green Tea Coke is practically non-existent. There's a Simpsons episode about the making of "Duff beer" where they show the beer pouring down three pipes into different containers. The pipes says "regular Duff", "Duff Dry" and "Duff Light", but the liquid pouring into the pipes is coming from the same central barrel/vat. This image came to mind after sampling this Coke Plus. It's as if Coke is pouring the same stuff into different bottles. If for some strange reason you'd like a desktop picture with Sarah Jessica Parker hawking Diet Coke beverages or the design on the bottles, you can download them here. I'm not a fan of lemon or lime in cola either.... not even in mixed drinks.... I always buy those fiber mini's... have your tried them?